I feel like I’m developing OCD in relation to saving my Word documents. Do other writers feel this way? Do they have a protocol typed and blue tacked next to their computer monitor? Yes- I need a poster. We all have our own skill set and remembering minutiae such as this is not part of mine. 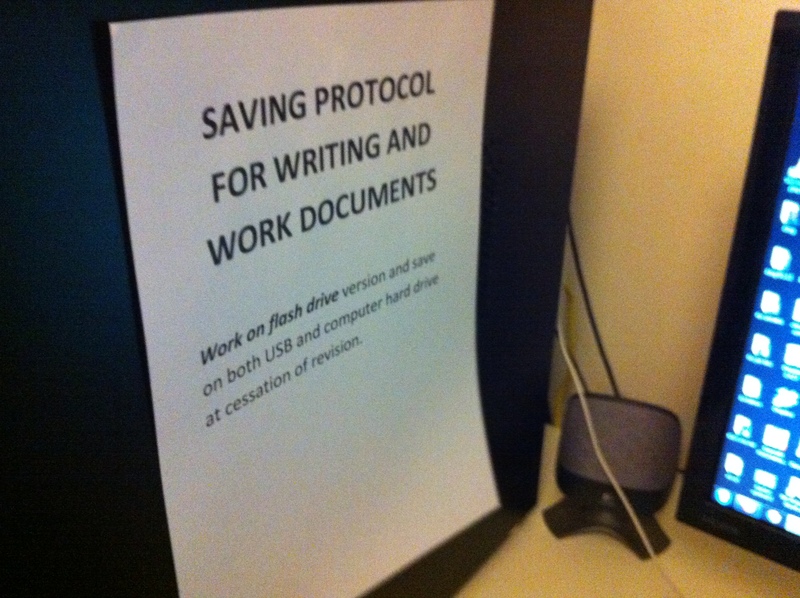 Have you ever accidentally saved an earlier version to your flash drive (when you should have transferred the document on the USB to your computer) and lost all revision? I have. Does it occur to you that those changes are gone forever? That you’ll be able to restore some of the most pertinent corrections but that the more nuanced parts, particular to that day, that particular revision session, are gone forever? That muse is a fickle beast and she’s gone, dragging those lovely new sentences behind her? I tried to keep it simple by saving my documents on my computer and doing a weekly back up. Seven days is a long time when you’re worried that the computer hard drive will fail (it’s happened before), or the house will burn down. I know I need to nut out this ‘Cloud’ business, or this ‘Dropbox’ business, but the idea of having my work stored intangibly in the heavens gives me the heebeegeebees too. So, fellow writers, how do you manage this? Any wisdom to impart?